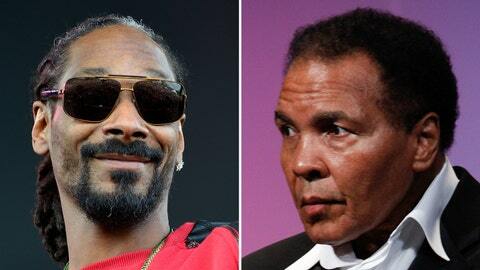 Coming to a sideline near you — Snoop Dogg & Muhammad Ali cheering in unison? When Snoop Dogg’s son transferred to perhaps the best high school football program in the nation during the last school year, the goal was to get the big-time recruit better-prepared for Division I. Turns out it also created the latest — and The Greatest! — sports/celebrity power couple. Cordell Broadus, a senior this upcoming season, is one of the nation’s top receiving recruits. In January, he transferred to Bishop Gorman High School in Las Vegas. Joining him at times in the Gaels’ huddle will be sophomore running back Biaggio Ali Walsh, grandson of Muhammad Ali. Broadus is well-known around the nation, ranked among the top 20 receivers in the nation by most outlets, reportedly with scholarship offers from the likes of USC, Baylor, Notre Dame and LSU. He played at Diamond Bar High in Southern California last season, but transferred because "he told me that he wants to play for a bigger school to get him ready for college," Diamond Bar coach Ryan Maine told the San Gabriel Valley Tribune in late December. Walsh has only one year on the freshman team under his belt, but he put up some eye-popping numbers and, according to TMZ, has big-play potential and at least one Bishop Gorman assistant is thrilled to have both players on the team. Not that the Gaels need the help — on the field or in increasing star power. The five-time defending state champions are the No. 1-ranked team in the nation according to USA Today, and last season the team’s QB was Randall Cunningham II, son of the former Eagles great. Plus the baseball team, ranked in the top 10 nationally, will have Chase Maddux (yup, Hall of Famer Greg’s son) in its rotation this coming season, and Basketball Hall of Famer and FOX Sports 1 personality Gary Payton’s son Julian plays basketball at the school.